Second best thing I came across this week — homemade “Febreze”! 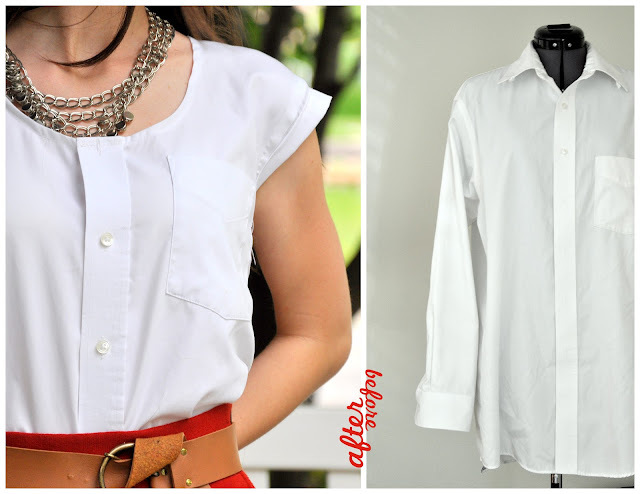 Made with fabric softener and baking soda, plus water. Also a must‐try! From Fake‐It‐Frugal. Aren’t these adorable? Perfect for a back‐to‐school gift. How‐to on Scissors Paper Wok. Oooh look! 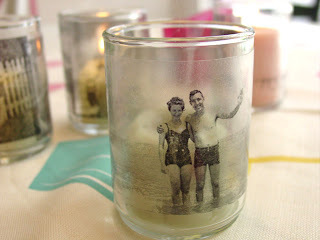 A similar method of image transfer as my recycling bin kaleidoscope, but used on glass votive holders, with old photos! How‐to on Inspired Ideas. This would be great for a young person going off to college, I think! 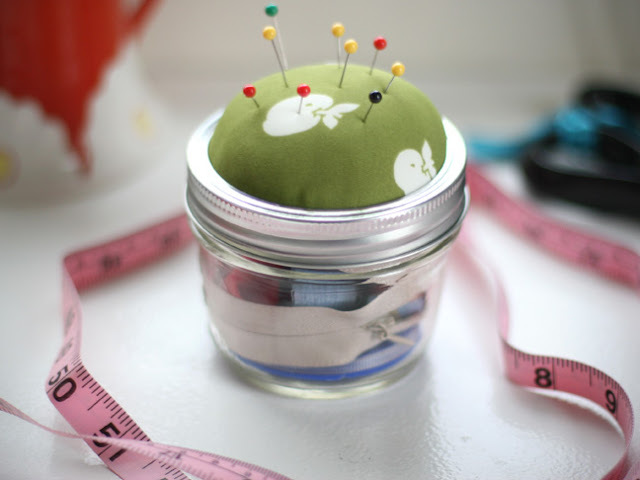 Mason jar sewing kit, from Say Yes! to Hoboken. Very cool‐looking way to turn mason jars into porcelain‐like containers — with hot glue and spray paint! From Pure & Noble. Very comprehensive tutorials to make different flowers with crepe paper from the Martha website — it demonstrates how to make everything from petals to stamens to leaves! In the photograph they look so realistic! 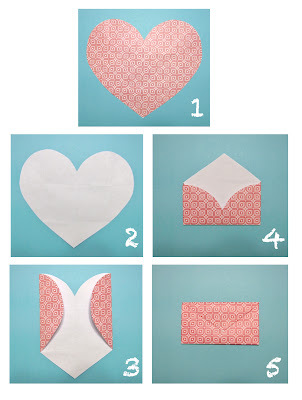 This is very neat — fold an envelope with a heart‐shape piece of paper! Perfect for daily love notes to hide in lunch bags. From Forty Weeks and then Some. I’ve been looking for this for the favourite things posts, and finally spotted it on Pinterest. I know that I first saw it in a Martha Stewart Living magazine, but I can’t seem to find any link for it. But anyway, the photos explains very well how it works, and the cabbage prints look quite amazing! Something to try one day. A dainty lace hairpin from McLaughlin Designs. I love the colour of the one pictured. Finally, thank you very much for all the feedback about the favourite things posts! I initially started recording my favourite things so I can keep track of projects I want to try one day, or ideas that inspire me. But I’m really happy that visitors to this blog enjoy these posts as much as I do, and that they feel inspired by these ideas and find them helpful too! Thank you so much for your encouragement and kind words! The pompoms are great for making while watching a movie I think. The ice cream will have to wait though: I just bought a magazine special about desserts and I’ve got my mind set on those raspberry ice tarts! 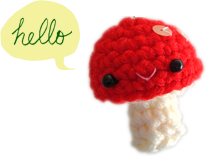 I’m in for the pencils, pom‐poms and mini‐sewing kit! Thanks so much! !